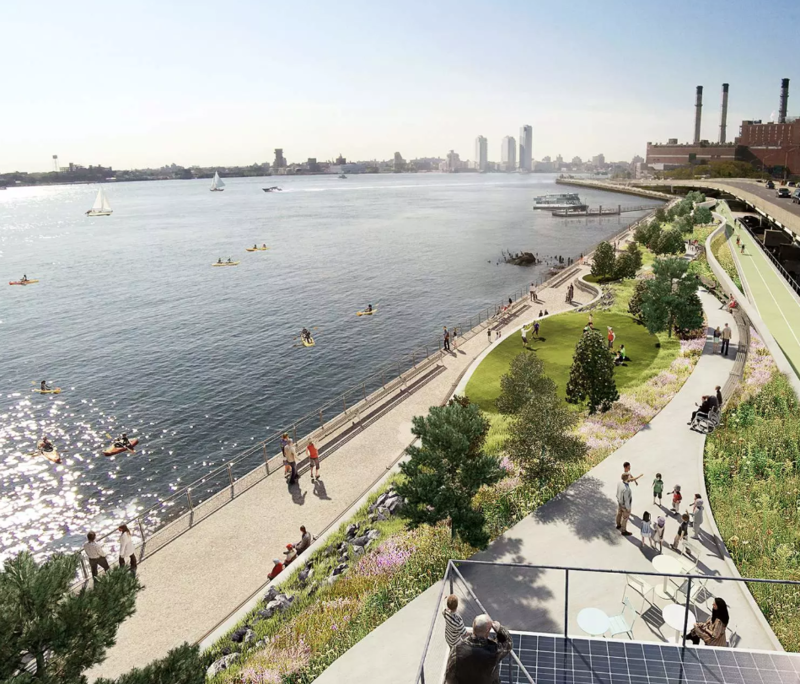 Manhattan's East River Park is expected to receive a massive facelift—and sooner than expected. Last week, Mayor Bill de Blasio's administration announced an update to nearly 70 percent of the design for the long-awaited East Side Coastal Resiliency Project (ESCR). The new $1.45-billion-plan will not only speed up the construction process and shift heavy construction work away from residential areas and closer to the waterline, it will also improve access to East River Park while transforming it into a world-class parkland. According to a press release, the purpose of the redesign is to allow flood protection to begin one year ahead of schedule. In addition, the entire project is now slated to be completed six months earlier than previously determined. 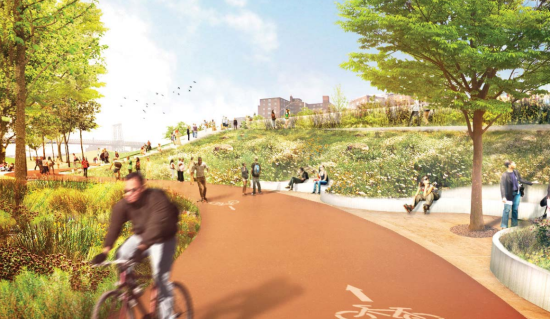 By pushing back the flood walls from FDR Drive toward the East River along the water's edge, there will be fewer barriers between East River Park and the local community, giving the 40-acre green space a more open and welcoming appearance. The flood walls will be directly integrated with the bulkhead and esplanade. Plans are also underway to create a spacious entry plaza at Houston Street with a direct passageway to the water, where pedestrians can stumble upon views of the East River with ease. 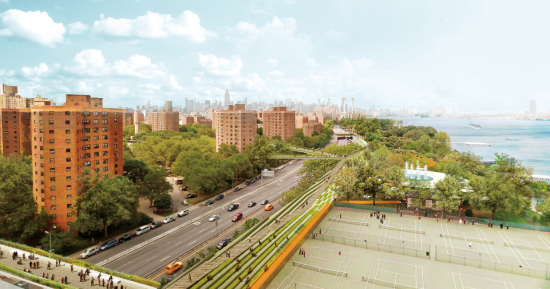 The new plan will also add 12 tennis courts, eight baseball fields, four basketball courts, three soccer fields, a multipurpose field, and a running track to Lower Manhattan’s largest park. The ESCR is a $335-million proposal to construct flood barriers along the coast of Manhattan, from Midtown East to the Lower East Side. Bjarke Ingels Group and One Architecture & Urbanism conceived the idea in the wake of Hurricane Sandy in 2013. ESCR is only the first of three stages of Ingels’ vision for the Big U, which in total comprises a 10-mile-long flood barrier that doubles as public space, extending from West 57th Street to East 43rd Street, curving around the southern tip of the Financial District and Battery Park. The radical plan for flood-prevention will protect the most vulnerable, low-lying areas of Manhattan, while also providing residents with public spaces to relax, socialize, and sightsee. Construction on ESCR is expected to begin in spring 2020. On Friday, Rebuild By Design (RBD) hosted a conference at NYU to check in on the progress on the region's ten coastal resiliency projects. Landscape architects, engineers, architects, and government officials representing the six initial winners and four finalists spoke on behalf of their team's ideas. Although each project is different in scale and scope (factors which correlate, not surprisingly, to the level of funding that each received), and all are at different phases of implementation, projects from Bridgeport, CT to Hoboken, NJ reflect a desire to build back, but better: Plans enhanced oceanfronts, baysides, riverbeds, and low-lying areas with graywater remediation, waterside parks, berms with bicycle paths, and oyster beds, and other amenities to enhance both resiliency and waterside quality of life. Consistent challenges emerged, too. Foremost was the challenge of implementing projects that require input and approval from multiple government agencies with varying jurisdictions and priorities. Community engagement is key to each project, with many teams noting that initial designs were modified in accordance with the input of property owners, business leaders, and residents. Construction on the first phase of the projects is expected to be complete by 2022. Although each project will undoubtedly make its area more resistant against 100-year floods, the most ambitious projects were the buffer of berms and floodwalls on Manhattan's shoreline that stretches from East 25th Street around the southern tip of the island, and Living Breakwaters, a series of wave-breaking rock-and-oyster-colony formations placed off the south shore of Staten Island. Carrie Grassi, deputy director for planning at the NYC Mayor's Office of Recovery and Resiliency spoke first about the Manhattan-based project. (formerly known as the BIG U). 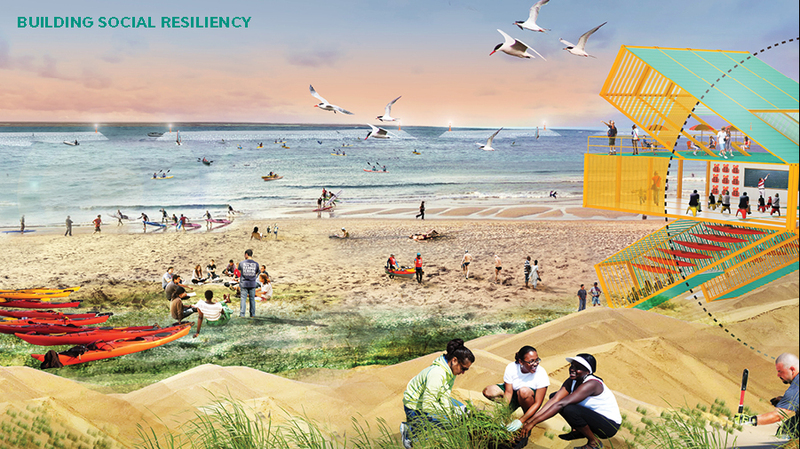 The project has two phases: Firstly, the East Side Coastal Resiliency Project (ESCR), whose team is led by AKRF with design and planning input from ONE, (RBD competition winners) BIG, and Mathews Nielsen. Secondly, the Lower Manhattan Coastal Resiliency Project, or Two Bridges, led by AECOM and Dewberry, with design and planning by ONE and BIG. Grassi noted that the team wanted to make phase one, 2.5 miles of waterfront, and waterfront-adjacent space, primarily for people to enjoy: "We want to create something that we can live with for the 99 percent of the time that we aren’t flooding." One of the challenges of implementing the ESCR was establishing an unprecedented joint task force between Community Boards 3 and 6. At public input sessions, residents asked that designs focus incorporating the berms into bridges, like at the Delancy Street pedestrian bridge, near where the Williamsburg Bridge touches down in Manhattan. Plans also called for kiosks and vendors under the FDR Drive overpass near Stuyvesant Cove; residents were worried that the darkened area would be uninviting during the winter months, so the design was modified. “All of these conversations were about tradeoffs," Grassi explained. "[We considered] the community's priorities and what was needed to advance the project and make decisions.” The draft scope of work is out, and a draft Environmental Impact Statement (EIS) is being developed. Next steps include "drilling down on the design," and the environmental and land use review, although the design leaves the opportunity for additional bridges to be constructed at a later date. $335 million of the project's funding comes from HUD's Community Development Block Grant Disaster Recovery (CDBG-DR) Program and $170 million in capital funds from the city. Construction is expected to begin in June 2017. The Two Bridges portion is being financed with an additional $176 million (CDBG-NDR) and $27 million from the city. Alex Zablocki, a senior program manager at the NYS Governor's Office of Storm Recovery and Pippa Brashear, director of planning and resilience at SCAPE/Landscape Architecture, closed the presentations with updates on Living Breakwaters, a stormproofing plan for the South Shore of Staten Island. SCAPE's design calls for network of submerged and partially-submerged concrete-and-recycled-glass breakwaters that will be planted with oysters. Living Breakwaters, Brashear explained, creates double resiliency by both mitigating the impact of shore-bound waves and "enhancing ecology" through natural water filtration (the project is partnering with the Billion Oyster Project, an initiative to re-seed oyster beds in the New York Harbor). To SCAPE, the strategy was not about keeping water out through walls and barriers, but about reducing the impact of flooding in the vulnerable Tottenville neighborhood. https://vimeo.com/91648619 Plans call for a rocky habitat shoreside with semi-enclosures for kayaking. The video above, from 2014, explains the coastal interventions in-depth. Between winning the RBD competition in 2014 and now, SCAPE has surveyed the coastline—above and underwater—extensively, and construction is expected to begin in the second quarter of 2017.